The University of Bedfordshire was established in August 2006 by order of the Privy Council and comprises five campuses, three within Luton, one at Bedford and one based in Aylesbury. There are 20,000 staff and students from over 100 different countries at the University creating a very diverse environment. With planned developments valued at over £134m spread over the next few years the University is an exciting and vibrant place to be now and in the future. Digital signage has been in use at the University of Bedfordshire for some time, with standalone units being installed in different departments. The objective of this project was to bring all the existing digital signage together and to provide for future expansion: the University is currently investing £35 million in a new campus centre where digital signage will play a key part in the communication strategy. Any new digital signage needed to successfully network with the existing infrastructure and the previous installations. The University was also keen to ensure corporate branding was used across all five campus locations, to create a professional look. Of particular importance was the requirement to show the appropriate content on each screen, targeted at the local audience, while retaining the corporate ‘look’ to each screen. For example the screen installed in the Business School foyer needs to show welcome messages and Business School specific information. With units installed in 17 different departments the digital signage needs to be easy to use by many different people, both technical and non-technical, as they are very content hungry and need to be constantly updated. The systems also need to be easy to set up, and quick to manage. ONELAN’s Net-Top-Boxes (NTBs) were chosen as the Digital Signage solution, due to their ease of use and their ability to apply highly customised layout designs, so anyone on the university staff can contribute without fear of problems. To reach an audience base of 20,000 students and staff, the screen layout flexibility and scheduling were of utmost importance. The ONELAN NTBs allow a screen to be divided into different Zones, which allow different media formats such as Live TV feeds, RSS feeds, animations, still images and audio. The University wanted a scalable system, particularly with the new campus centre in mind, and ONELAN fitted the bill. One main publisher NTB supplies content for 17 subscriber Century 610 NTBs. These are located in the main Foyer, in the Park Square campus, the Learning Resource Centres on the Luton and Bedford campuses, reception areas in Butterfield Park, Buckinghamshire and Putteridge Bury campuses as well as various other social spaces. One of the key aspects of the project was the installation of an Omni-Server. Originally the University required an ‘off air’ recording solution for the academic staff to use. With the Omni-Server, they are now able not only to do this, but also link into the digital signage network. This provide the screens with live TV feeds for news and educational TV channels across the network infrastructure without the need to run additional RF cabling, thereby keeping additional costs to a minimum. A wide variety of content is being utilised including public content such as a TV feed showing BBC News and Sky News, XML feeds for local weather and news, as well as University news and events. An XML feed from the Association of Train Operating Companies is planned. This will deliver up-to-date timetable information for Bedford and Luton stations to help promote sustainable transport options. The signage is also used for department specific information, such as information for registration and Open Days, and content throughout the university. Integration with the university’s existing networks has been straightforward. Feedback has been very positive: staff like the look of the content. 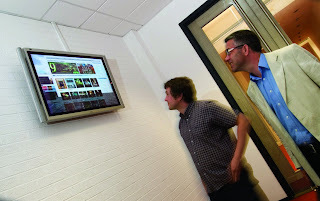 Digital Signage Specialist ONELAN has agreed to sponsor the 2009 AV Awards. As a former winner of the prestigious AV Digital Signage Company of the year award, ONELAN are proud to be sponsoring the same category in 2009. Digital Signage Specialist ONELAN will be supporting AsiaVoila at InfoComm China on 9 - 11 November 2009 in the National Agricultural Exhibition Center (New Hall) Beijing, China. The show is the 6th in the series of dedicated ProAV tradeshows organized by InfoCommAsia Pte Ltd for the Chinese market.